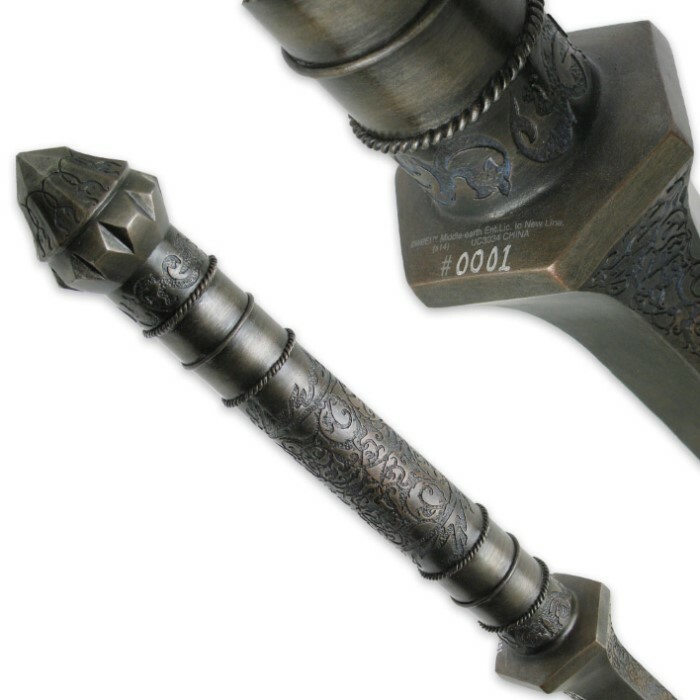 This massive mace was wielded by the Dark Lord Sauron in the prologue of The Lord of the Rings: The Fellowship of the Ring. 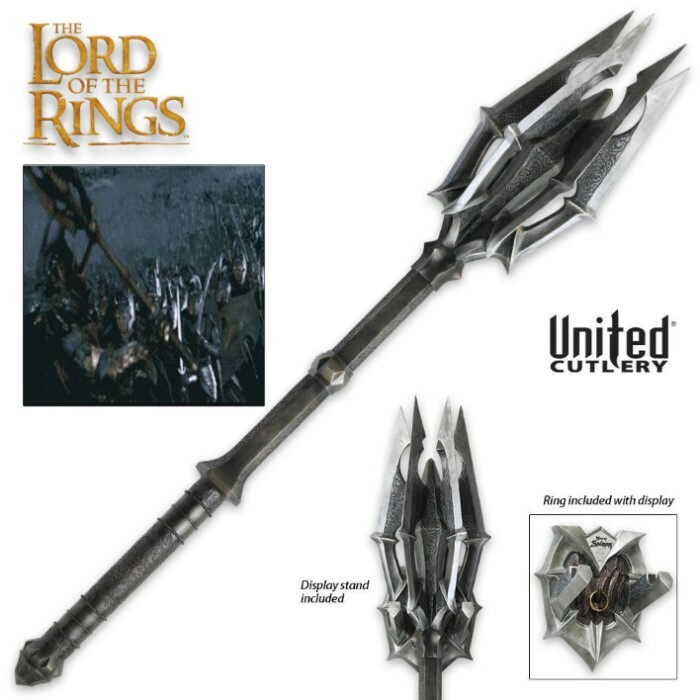 When Sauron's forces battled the Last Alliance of Elves and Men on the slopes of Mount Doom, Sauron emerged on the battlefield carrying the massive six-bladed, black iron war mace. He also wore the source of his power, The One Ring. This replica of his mighty weapon is an exact reproduction of the actor scale prop used in the movie. It is crafted of reinforced fiberglass-resin with an aged iron finish. Close attention to detail is a top priority in every piece, down to the intaglio-etched surface and corroded metal coloring. The oversized One Ring worn by Sauron is also included and is finely crafted in gold plated solid metal. This collector's dream set displays on a poly stone wall mount. True Swords never ceases to please me. After ordering this on a Saturday, it arrived the following Wednesday. It's a very good chunk of change, but when the sale's going on, it is well worth the price. The mace is quite heavy (by which I mean I can't hold it in one hand). I recommend being careful of the blades, they may break with only a little stress. So long as you don't go swinging this around at people, you should be as pleased as I am. I LOVES ME MACES!!!!!!!!!! OMYGAWD THIS IS GREAT!!!!!!!! Very great piece! I love it. I started collecting LOTR swords from United many years ago. The Mace of Sauron commands the attention it deserves hanging on the wall along side the other swords in my collection. You will not be disappointed. AWESOME !! 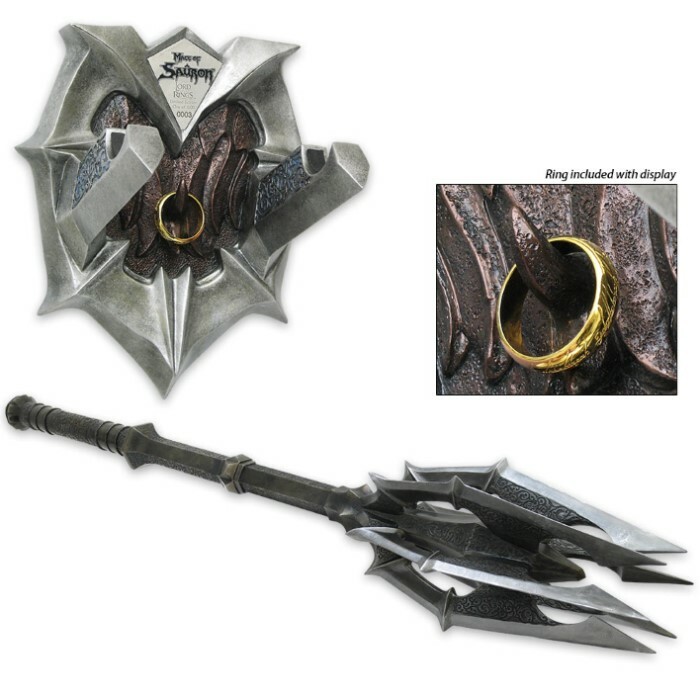 This mace is even better then the Azog mace which I have too. They both look great next to each other on the wall. This is made of resin only for show not for battle Highly recommend. this is absolutely a Beast of a weapon!!! i always wanted this to be made back when UC started making the weapons and knew it would be one of my favorites!!! now it is and finally i get to hold this beast!!! just a very detailed weapon and has good weight to it! even though its not steel, its an awesome piece!!! wasnt to sure about getting polyurethane pieces but it is well worth it!!! a great addition to my big collection and displayed next to my Sauron helm and gauntlet!!! as for the one ring, im not worried about no interior graving but you can tell these are extra rings from the Gauntlets!!!! overall....im pleased and couldnt be much happier with #8 of 1500!!!! This is, along with the Helm of Sauron, is the centerpiece of my LOTR movie collection. The shading and attention to detail is fantastic. You could not achieve the color effects using metal, also, the weight and cost would be prohibitive. If you take a strong magnet and put it to the blades, you can feel a light attraction indicating steel under the resin. I think this is where the weight partly comes from, and they are also using a heavy stone resin. The Intaglio etching is beautiful and matches the etching on the Helm. It is approximately Twice the size of an actual mace, and it is only Actor scale. It is a grand wall decoration, and so heavy you wouldn't think it was resin. Top flight. The One Ring was a bit of a disappointment. It is too light and only engraved on one side. The interior of the ring is absolutely flat and blank, as if someone had drilled it out. I don't think it matters. Of course I already have a One Ring.